Today I finished a bottle of spray cleaner, and it gave me an idea of an activity. I cleaned it carefully, then added some watered down ready-mix poster paint (the end of a bottle with water shaken into it, I guess about two tablespoons of paint and two cups of water shaken up in the bottle). 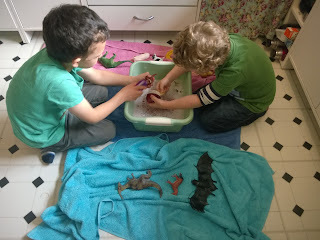 The boys were sent off with instructions to find toys that were interesting shapes and easy to wash. They came back with mostly dinosaurs and farm animals, which they laid out on some paper from a roll (we used an Ikea drawing paper roll, but any big paper will do so long as it's not shiny). When the boys were happy with their arrangement they sprayed over their shapes. The spraying itself was fun, but when they removed the toys to reveal the white outlines they were amazed. 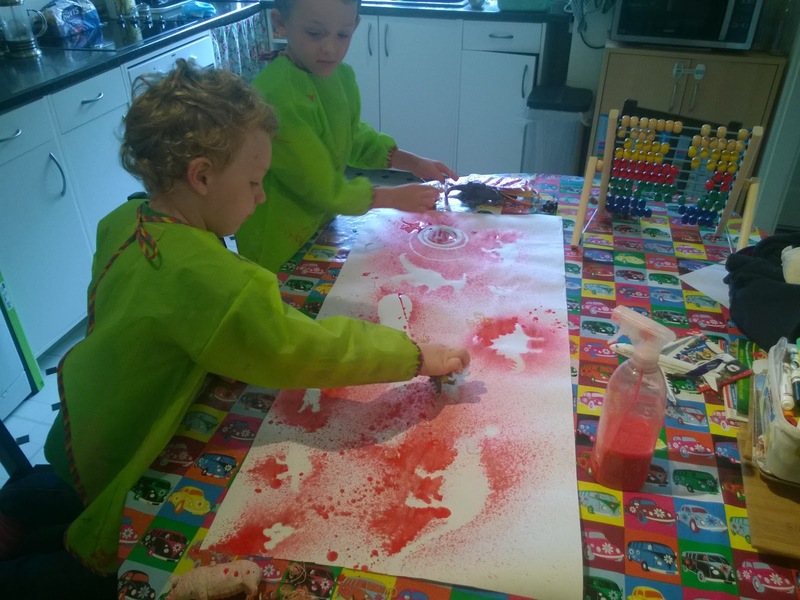 The activity was really quick to set up, and they loved it so much they kept going until we had used up all spaces available for drying large pieces of paper. 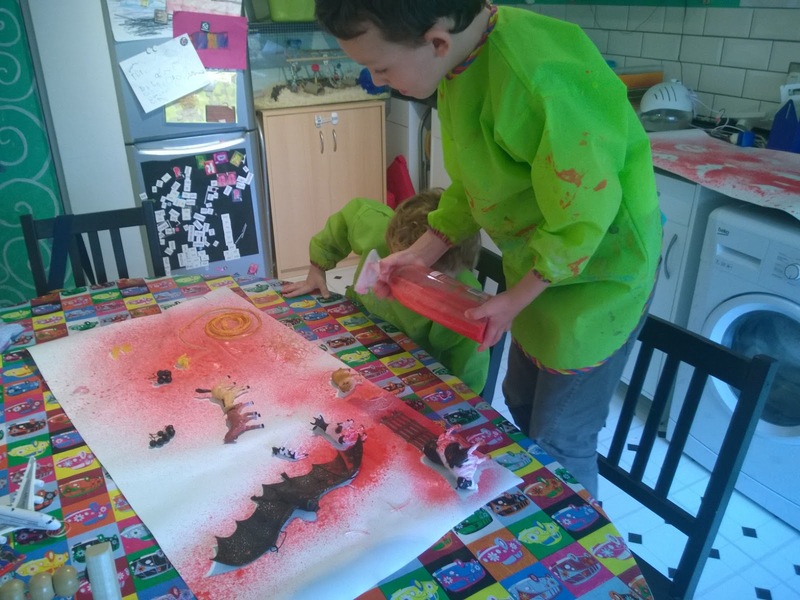 I then explained how many examples of cave art exist around the world where our ancestors would spray colours made from ochre, chalk and soot over their hands to produce beautiful handprints. We made our own cave art hand prints on a piece of A4 card. Once we'd finished being artists, the toys all enjoyed several bubble baths in the washing up bowl. It didn't take much to get the paint off as we didn't leave it long enough to dry on, but the bathing seemed almost as much fun as the painting so I was happy to let them have a few water changes. The boys love the book we took out from the library 'Cave Baby' and have enjoyed looking at examples of cave art from around the world on the computer, so as well as a fun art play activity it links nicely with other things to find out about. The technique could also be easily adapted to make seasonal displays, for example using autumn leaves as shapes to spray over. 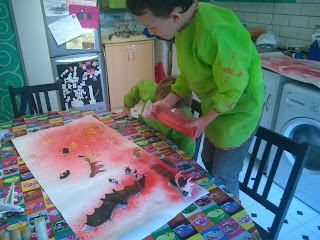 I think my favourite thing was how big an impact it had on the kids - they could very quickly arrange a scene and spray it to make a story with their animals in a way that they find slower and harder when drawing and painting, so as a way of capturing their role playing with the plastic animals it was fantastic. Note: I thoroughly cleaned the spray bottle before use, but it only had an eco cleaner in it beforehand, I wouldn't use something that had hazardous things such as bleach in it previously. A regular plant mister will work, but I'm happier with recycling a bottle for this as I won't worry if the paint clogs it up. 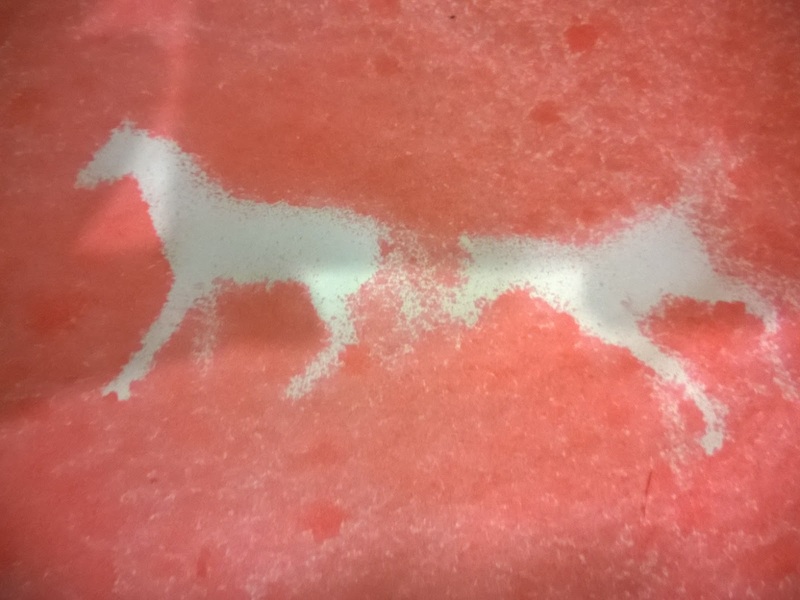 As a way of using up that last bit of paint in the ready mix bottle it was good, but I found red paint looked a bit like something off a crime scene show while we were using it. I suggest not leaving kids unsupervised with this one either, and guiding the hands of little ones, to avoid paint sprayed over the walls and each other.